I LOVE the month of May. After a long, cold, Vermont winter and a raw, chilly mud season, it's glorious when the green starts to return to the landscape. I savor the progress each day brings: first the crocuses, then the daffodils, then the peepers, then the newly born leaves. One of the perks of spring is free food in the form of ramps - wild leeks. Ramps have a small bulb and wide green leaves, both of which are edible and have a delicious oniony flavor. Ramps have become quite trendy in recent years and are in danger of being over-harvested in some areas. Thankfully, the place I gather ramps is in little danger of depletion - there are thousands upon thousands of ramps carpeting the ground over a wide area. 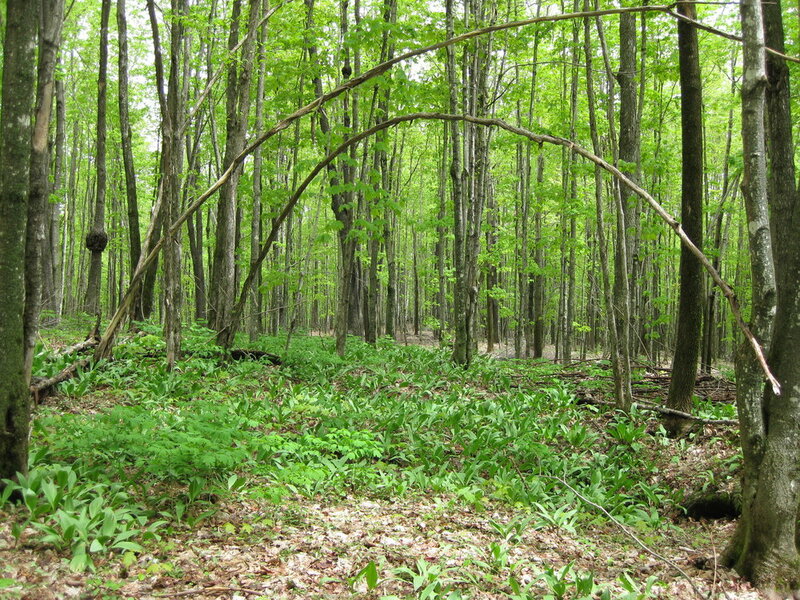 The places I have seen ramps growing in abundance have several features in common: a tall hardwood canopy, predominantly maples, with few or no conifers; a gentle slope; and abundant blue cohosh growing nearby (Note: blue cohosh is NOT edible - it’s a somewhat toxic medicinal). Later in the spring, ramps have a white flower, which matures into shiny black seeds. The flowerspikes with seedheads should be visible later in the summer, when the leaves have died back. Sometimes some of the previous years' seedheads can be found still hanging on. Even where there is such an abundance of ramps, I am considerate when I gather them. I dig some bulbs, but mostly gather the leaves. I take only a few from each patch and then move to the next patch. Ramps can be used in place of any leafy green, as long as an oniony flavor would be welcome. I especially like them in scrambled eggs with cheddar cheese. They can only be harvested for a couple of weeks each year, so enjoy them while you can!